Since 2005, the Scafit team has provided scaffolding solutions to hundreds of clients in the lower and central North Island. Our team offers innovative and efficient scaffolding with exceptional service. We are 100% locally owned and operated, with our headquarters in Palmerston North, and a team of over 60 staff operating out of our Palmerston North, Wellington and Whanganui branches. This is about clients, contractors using our scaffolds, and most importantly, our crews. 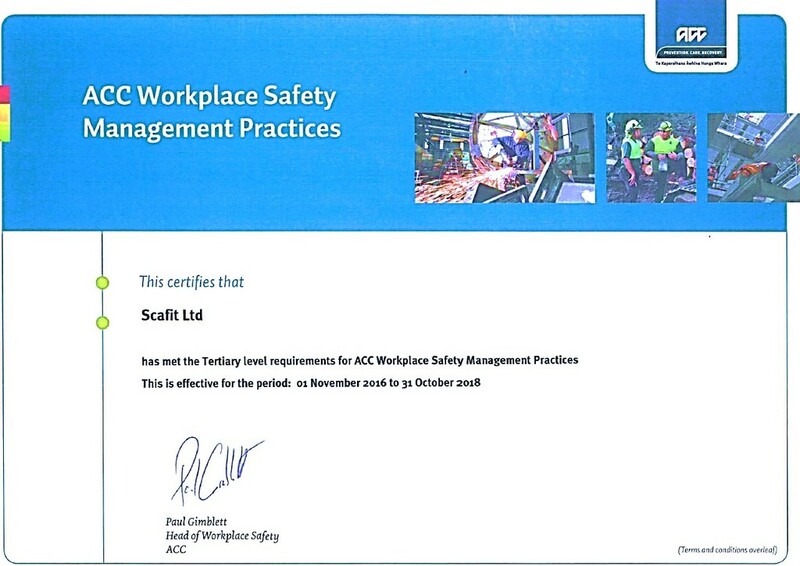 Accordingly we are tertiary level ACC Workplace Safety Management Practices accreditation, which means we practice what we preach. Our customers know we intend to provide the solutions and value and that we are here for the long-term. If the mission does not go to plan, then we step up and remediate or help come up with another plan. We place emphasis on providing quality solutions. We only use genuine Layher scaffolding equipment and European manufactured safety nets, both of which are precision made to the highest standards. Our most important asset is our people. It is important that we enjoy our work and that we are appreciated for what we bring to the team and what we achieve. We know our trade and we know what it takes to be recognised as a leading professional.